This large rental apartment house has fabulous views and one of the best and most elegant residential locations in the city. It shares its avenue frontage with the neo-Georgian-style Knickerbocker Club designed by Delano & Aldrich. It was erected on the site of a large neo-Georgian-style townhouse owned by Mrs. Marcellus Hartley Dodge who lived in New Jersey and so rarely used it that it was considered one of the city's "mystery houses," especially since its large garden facing the avenue was for decades boarded up behind a tall fence. The house was designed by R. S. Shapter in 1922 for Mr. and Mrs. Marcellus Hartley Dodge. He was head of the Remington Arms Company and she was a Rockefeller heir. After her husband's death, she spent almost all her time on her estate in Madison, New Jersey, and used the front yard of the New York townhouse for her many dogs on her occasional visits back to the city and the house was filled with much of her art collection of animal paintings by Rosa Bonheur. The house appeared boarded up but a housekeeper lived in it most of the time. Interest in such a prominently sited property being not used was such that a story about its redevelopment made the front page of The New York Times after she died in 1973. "As originally proposed for the site, 800 Fifth Avenue was to take advantage of bonuses recently made available to park-fronting property owners, awarded not for the inclusion of plazas but for financial contributions to the maintenance of Central Park. 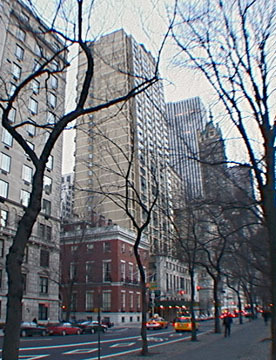 In order to facilitate the bonus application, the City Planning Commission urged Bernard Spitzer, the developer, to retain a design architect to rework the plans drawn by...[his architects], who had also worked with the developer on 200 Central Park South....Spitzer chose Ulrich Franzen, who eventually presented a design he described as 'a stern, proper bottom breaking into a "joie de vivre" top'; It consisted of fourteen floors built up to the Fifth Avenue street wall and, set slightly back, a nineteen-story slab punctuated by bay windows and topped by an ornamental copper roof loosely suggesting the mansard roof of the Hotel Pierre, its immediate neighbor to the south. A low wing containing offices was proposed to run along Sixty-first Street, set back behind a small plaza. Despite the support of the editors of The New York Times, Franzen's design was rejected on May 8, 1976, by Community Planning Board 8, which objected to its height, its mid-block plaza and the use of brown brick for the facade instead of the limestone or light tan brick typically used along Fifth Avenue. By late June, Franzen had come up with a second proposal, which Paul Goldberger called an 'impressive improvement over the old.' In this scheme, Franzen pushed the tower back twenty feet from the avenue and lined the base up with the street, treating it as a Classically inspired limestone screen wall that echoed the base of the Pierre and the total mass of the Knickerbocker Club. The east facade of 800 Fifth Avenue, which overlooked a still quite intimate, low-lying landscape of townhouses, featured boldly staggered ranks of balconies that were meant to complement the area's residential scale but did not quite succeed. In July the revised scheme was approved by the City Planning Commission, and demolition on the Dodge house was completed by February 1977....When the building was completed in late 1978, the first tenants were appalled by the shoddy workmanship inside, the low (8'2") ceilings, the inadequate ventilation for kitchens and host of other details that belied its claim to luxury accommodation. Other observers, like Ada Louise Huxtable, were critical of the exterior. Reflecting on the process that led to the final design, she wrote: '[Franzen's] first revised design was full of references to the surroundings so abstract that only the architect could know for sure...The next version...was negotiated to death by the city and the community. The result is a pitiful compendium of watered-down mannerisms that are supposed to maintain the integrity of the avenue and relate to adjacent buildings, but speak more clearly of the inflation of costs and impoverishment of crafts in our own times...If there is any achievement here, it is making the bland grotesque.' In 1979 Paul Goldberger characterized the design as one that 'rejects the modernist principle' of a building as a 'pure object' and seeks an accommodation with the context, 'at the price of consistency or even at the price of any rigid ideology at all.' While Goldberger found this approach fine in theory, in reality the building was 'so big that ideas and principles don't matter.' Though he found the limestone front along Fifth Avenue handsome, 'and a welcome attempt at craftsmanship in a day when putting a chandelier in the lobby is considered fancy apartment-house design' it was not enough to 'offset the immense mass behind it.'" Franzen's first design actually was the better of the two as its base was quite vigorous and bold and complex although the top curved bay windows were unrelated to the rest of the design. Franzen's base was also awkward and consisted of low curved arches, which he eventually employed for the mid-block plaza's fence in the second and final design. 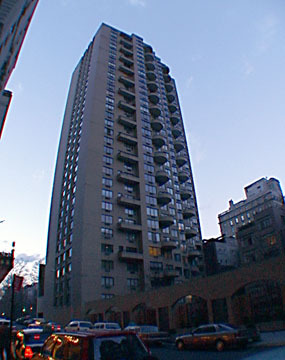 Spitzer would subsequently employ large curved bay windows to great effect in his Corinthian apartment tower on First Avenue at 38th Street, a building designed by Michael Schimenti. This building, which is across the street from the Pierre Hotel, has fabulous views and one of the best and most elegant residential locations in the city. This 33-story, yellow-brick tower was erected by Bernard Spitzer in 1978 and designed by Ulrich Franzen & Associates with Wechsler & Schimenti as associate architects. 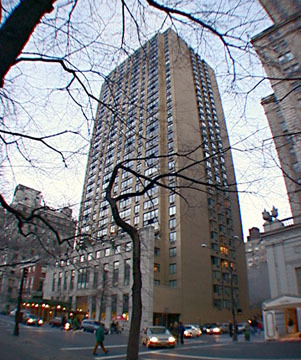 Mr. Spitzer also developed another high-rise apartment tower on the avenue, No. 985, between 79th and 80th Streets. 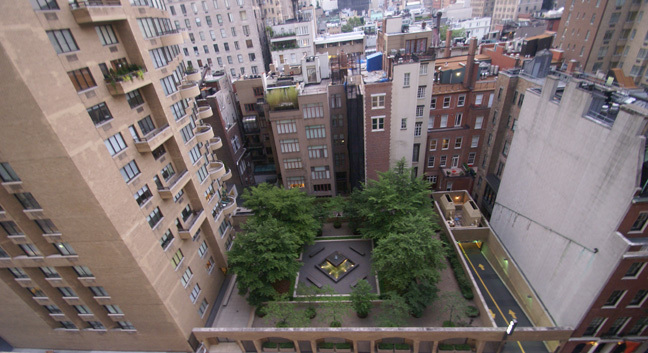 His other major projects have included the Corinthian at 38th Street and First Avenue and 200 Central Park South. The base of the building on the avenue is faced with limestone and contains commercial space. The tower is setback from the base, which helps preserve vistas of the very handsome towers of the Pierre and Sherry Netherland hotels from the north. Because the Pierre's tower is setback considerably on its base, this building has many good corner views of midtown as well as Central Park. There are corner windows along the side-street to take advantage of the views. The building, which has 208 apartments, has many balconies, which are curved, on its east facade. This building has a very large mid-block garden at its rear that has an imposing fence with curved elements along 61st Street across from an entrance to the Pierre Hotel. The spacious mid-block plaza usually appears to be locked to the public. The building has a concierge and doorman as well as a garage and a gym and it allows pets. It has consistent fenestration and discrete air-conditioners. There is excellent bus service here and a subway is one block away to the south. This site has considerable traffic, but is convenient to many fashionable boutiques and restaurants. Given its very prominent location, this building is very disappointing, although at least its fake-front limestone base and setback tower somewhat mitigate its intrusion into this prestigious precinct. The tower is setback a bit from the base but the development has a very large mid-block garden at its rear that has an imposing fence with curved elements along 61st Street across from an entrance to the Pierre Hotel across the street.